HTC continues to bring value to their customers, even after the initial purchase. 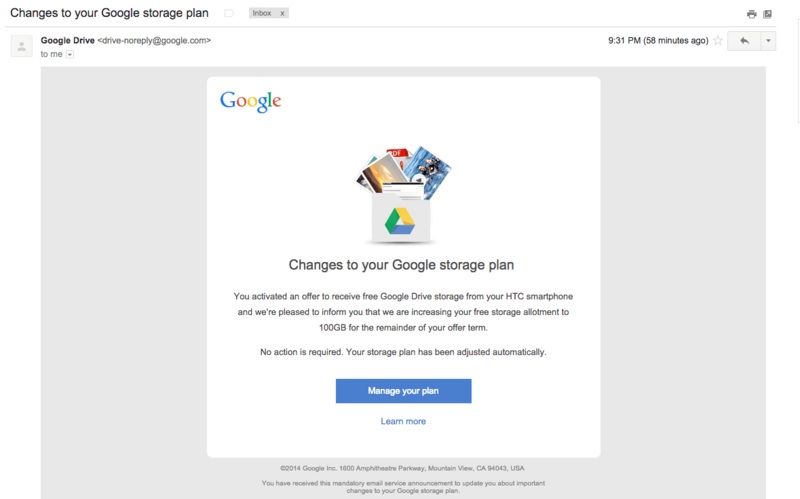 HTC has just given many of their handset owners 100GB of free Google Drive storage for two years. If you have a semi-current HTC phone, chances are good you’ve been given a boost to your cloud storage total. This offer is a part of HTC Advantage, which encompasses many things. When you buy a HTC device, you already get cracked screen replacement, a promise to update the platform to the most current version of Android for two years from launch, excellent customer service and now a boost to your Google Drive storage. HTC seems to be supporting their customers like no other OEM can. As far as eligible devices go, mostly everything current gets some bump. The M8 is the hottest new device, and as such it gets 100GB of Google Drive storage for two years. The two newest editions to the Desire series, the 816 and 610, both get 100GB for two years as well. HTC’s One Max gets the same 100GB treatment. As far as I am concerned, it is crystal clear that HTC is offering as much as they can to every customer. There is no other OEM I’m aware of that offers this sort of experience to their customers. Most are happy to give you something with a purchase. To give Google Drive storage after you have already bought into their phone shows appreciation for your business and desire (no pun intended) to continue to keep you as such. I’m interested to see how many end users actually care about an OEM who supports their products in this way. We, as enthusiasts, already know we care about continued support and bonuses for buying a phone we already decided on. The average end user may not even know these types of things exist. For what it’s worth, I’ve been impressed with the M8 and continue to use it as my daily driver. Getting some bonus storage was a very nice surprise that I didn’t expect. For these reasons, when it comes time to pony up my dollars for a device, anything HTC brings to the table in the future will be something I’ll consider. Do you agree or disagree with my feelings? Do you wish your OEM would provide you with a similar level of service, or are you happy with what you have? Shout it out in the comments, as it’s your opinion that matters more than mine.